Whether you are planning a quick weekend trip or a longer honeymoon vacation, America’s small towns offer a combination of history, adventure and relaxation that will help you create romantic memories to last a lifetime. Picturesque coastal towns, mountain hideaways and historic destinations that made our list are well known for their stunning scenery and friendly service. You will find a diverse selection of romantic things to see and do in these beautiful places, from snorkeling and whale watching to art galleries and gourmet restaurants. Nestled on San Juan Island in Washington State, the charming town of Friday Harbor is one of the best places to honeymoon in the U.S. for those who love whales and ocean views. Dotted with turn-of-the-century wooden-frame houses and quaint historic storefronts, this romantic coastal fishing village is small enough to be easily explored on foot. 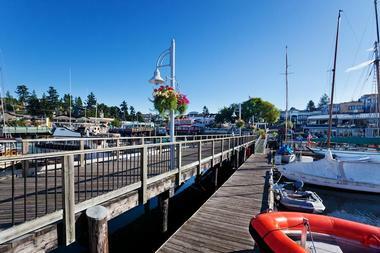 Friday Harbor has a vibrant art scene, a rich historical background and a diverse choice of excellent restaurants. 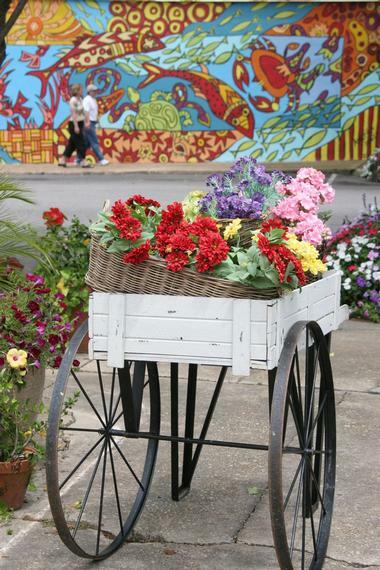 On your walk through the town, you will find murals and mosaics by local artists. Galleries are filled with wonderful works of art created on the island. On summer evenings, listen to live music and watch theater productions under the stars. Plan to stay over a weekend if you are interested in festivals, fairs, shows and the San Juan Island Farmers Market. Rent a bike and explore the Historic District, which is home to many fascinating museums. 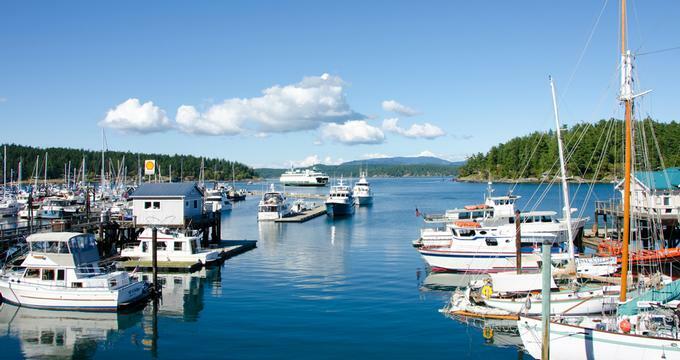 Learn the history of the Port of Friday Harbor, and watch whales right from the shore. Where to Stay: Bird Rock Hotel (from $109, Phone: 360-378-5848) has European-style guest rooms and Jacuzzi suites with harbor views. Where to Eat: Relax with a view of the San Juan Channel at the Bluff at Friday Harbor House while you savor a multi-course dinner prepared with fresh fare caught in the waters around the island. Don’t Miss: A whale watching cruise. 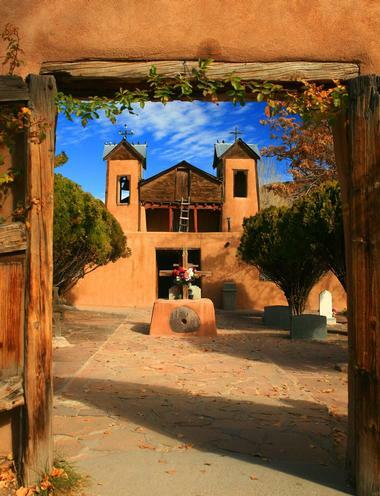 Surrounded by rugged majestic mountains and the wild Rio Grande River, Taos has a magical quality that has attracted artists and photographers for centuries. Taos Pueblo, a World Heritage Site by UNESCO, is home to examples of beautiful adobe architecture and the only living Tiwa Native American community. Where to Stay: Check into one of the bright, adobe-style rooms with kiva fireplaces and traditional decor at Casa Gallina. Don’t Miss: A guided tour of Taos Pueblo. More honeymoon destinations in the US - West Coast: California, from Seattle and Oregon. The relaxed coastal town of Cambria, California, is surrounded by the breath-taking natural beauty of towering pine trees and the Pacific Ocean. Located halfway between San Francisco and Los Angeles, Cambria is about a 4-hour drive from each city, making it a great weekend getaway for honeymooners and couples. The town’s rich history is reflected in the beautiful old homes and museums, including the Cambria Historical Museum and the Historic East Village. Take a romantic walk along the beach and look for giant elephant seals. There is a network of hiking trails that wind along the coastline and offer spectacular ocean views. Cambria has wonderful galleries displaying local artists’ works, a live theater and music events. The town hosts several popular festivals such as the Cambria Art and Wine Festival, the Cambria Western Dance Jamboree, and the Cambria Festival of the Trees. If you are looking for honeymoon spots in USA on the coast, Cambria is a great place to visit. Where to Stay: The 20 renovated guest rooms at the Blue Dolphin Inn (from $157, Phone: 800-222-9970) are located just steps from the beach. Don’t Miss: Take a tour of Hearst Castle, a magnificent hilltop estate. Home to unique art galleries, historic sites, one-of-a-kind literary festivals and vibrant nightlife, Key West, Florida, is a honeymoon destination for those who enjoy a relaxed beach lifestyle. 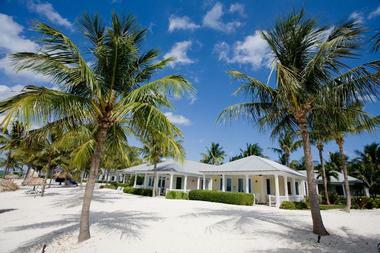 Beautiful palm-fringed beaches and turquoise waters offer an array of watersports and sunbathing. The famous Duval Street is home to diverse shops, bars and cafes. Where to Stay: Wake up to ocean breezes at the luxurious La Mer Hotel & Dewey House (from $519, Phone: 800-354-4455), located just steps from the beach. Where to Eat: Bistro 245 Restaurant at the Westin Key West offers outdoor dining with views of Key West Harbor. The restaurant serves American cuisine in an elegant setting. Don’t Miss: Snorkeling in the calm waters of the Florida Keys. Texan hospitality meets German tradition in this charming town. Located in the heart of Hill Country and surrounded by verdant patchworks of undulating vineyards, this quaint town is one of the best honeymoon destinations in Texas. 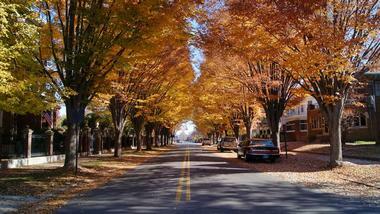 Fredericksburg is famous for its German colonial heritage and culture. Where to Stay: Stay at the romantic Cotton Gin Village which has gardens and koi ponds or at Barons CreekSide close to Main Street. Where to Eat: Have lunch at The Bistro – Vaudeville which serves farm-to-table cuisine with ingredients from local farmer’s markets and ranches. Don’t miss: Wine tasting at one of the local wineries. 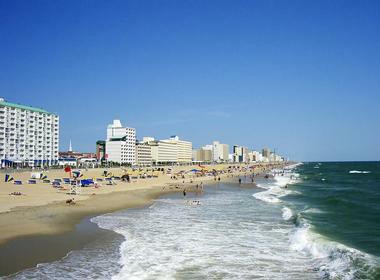 Located at the mouth of Chesapeake Bay, Virginia Beach is a vibrant seaside resort town with miles of beautiful beaches, a bustling oceanfront boardwalk and an array of hotels, restaurants and nightclubs. Visit the Virginia Museum of Contemporary Art and the annual Boardwalk Show, which showcases the best of Virginia Beach’s art scene, or catch a show at the Virginia Beach Amphitheater. Where to Stay: Suites with sunset views and a private beach make Virginia Beach Resort Hotel (from $99, Phone 800-468-2722) a great choice for couples. Where to Eat: Zoes serves a selection of stakes and seafood in a romantic setting with soft mood lighting. Request one of the intimate booths for more privacy. Don’t Miss: A romantic walk along the beach at sunset. Combining the best of both worlds - a historic river district and beautiful beaches - the coastal town of Wilmington in North Carolina is the perfect place to get away from it all. Surrounded by pristine natural beauty, rich culture, history, and an array of interesting attractions, this vibrant seaside town is full of charm and romance. Resting on the banks of the Cape Fear River, moss-draped oak trees stand between an eclectic mix of Victorian and antebellum architecture that line the city’s historic district. 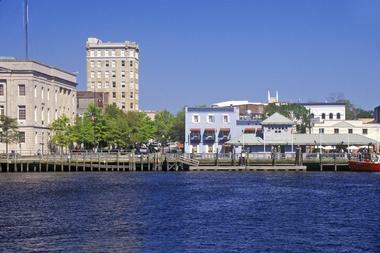 Where to Stay: The Graystone Inn (from $159) offers romantic rooms and suites in the heart of Downtown Wilmington. Where to Eat: Aubriana’s serves contemporary American cuisine, including Maine cold water lobster, Filet Mignon and impossible-to-resist desserts. Don’t miss: A stroll through the romantic Victorian garden at the Bellamy Mansion. Home to the University Of Michigan, Ann Arbor is a warm and welcoming North American town with a vibrant energy, sophisticated charm, and beautiful natural surroundings. The town is well known for its cultural offerings, with abundant opportunities to enjoy the arts and culture scene, ranging from thought-provoking art exhibits to inspiring performances by jazz legends. Exclusive galleries with hands-on exhibits and exceptional museums with prestigious collections, including the newly-renovated University of Michigan Museum of Art, are well worth a visit. Where to Stay: The Bell Tower Hotel (from $183, Phone: 800-562-3559) offers European-style décor and a central location. 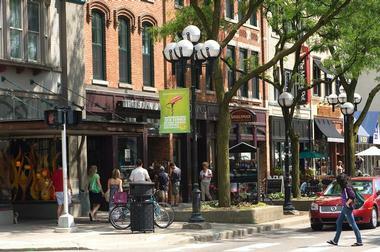 Where to Eat: Zingerman's Delicatessen is a popular stop in town. Don’t Miss: Visit the 335-acre Matthaei Botanical Gardens and Nichols Arboretum and have a romantic picnic surrounded by nature. Resting on the shores of Lake Superior at the northern tip of Wisconsin, Bayfield is home to some of the county’s greatest natural treasures – the Apostle Islands National Lakeshore, a series of pristine islands known as “The Jewels of Lake Superior” and the famous Ice Caves. Bayfield’s beautifully preserved Victorian-era buildings, leafy, hilly streets and rows of trees exude a tranquil charm for visitors escaping from the city and local artists whose works are displayed in boutique galleries and workshop all over town. The town’s biggest draw are the Apostle Islands, 21 rugged islands freckling the coastline that are ideal for hiking, swimming, kayaking and camping. Enjoy a guided kayaking tour, which takes you through majestic natural arches and caves around the islands or head further afield on a glass-bottom boat to view ancient shipwrecks. Dine on fresh local fish and fare at one of the many welcoming cafés and eateries around town. Where to Stay: Rittenhouse Cottage (from $297) at Old Rittenhouse Inn has a living room with a fireplace, wet bar and whirlpool tub. Where to Eat: Ethel's at 250 (Phone: 715-779-0293) serves pizza, pasta, freshly caught fish, sandwiches and desserts. Don’t Miss: Go on a one-of-a-kind dog sledding day trip with Wolfsong in the winter. Home to spectacular natural scenery, magnificent Gilded Age architecture, a bustling downtown waterfront, and beautiful places to stay, Newport is one of the most romantic destinations on the East Coast. Spend an afternoon exploring ornate French cottages, exquisite Elizabethan manor houses and richly decorated Italian palazzos adorned with priceless décor that were built by famous families like the Astors and the Vanderbilts. Discover the history of the town in its array of museums and beautifully preserved Colonial-era architecture, or head out to one of Newport’s panoramic vineyards for an afternoon of wine-tasting. Newport’s yachting marina is one of the most active in the country and bustles with the comings and goings of exquisite sailing vessels, while the town offers a wealth of chic boutiques, romantic inns, trendy cafés and excellent places to eat fresh seafood. Where to Stay: The Vanderbilt Grace (from $330) is located in a 1909 Newport mansion built by Alfred Gwynne Vanderbilt. The hotel has 33 guest accommodations, a luxurious spa, two gourmet restaurants, and indoor and outdoor pools. Click here for other great ideas. Where to Eat: The Grill at Forty 1 North has an outdoor terrace with views of the marina and serves grilled meats, seafood and organic dishes. 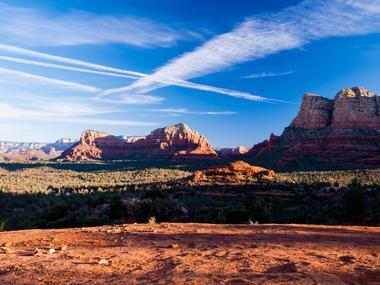 Spectacular scenery meets soul-nourishing spiritualism in the tranquil and romantic town of Sedona. Nestled amidst striking red sandstone formations at the south end of Oak Creek Canyon, this desert oasis is breath-takingly beautiful and the perfect place to escape and re-energize. The surrounding monoliths cradle an array of luxury resorts, spas, trendy art galleries and boutique wineries for those looking for a bit of pampering, while millions of acres of national forest land, deep canyons and high peaks offer excellent hiking, mountain biking and horseback riding. Where to Stay: L’Auberge de Sedona (from $293) has a Romance Concierge who can help you customize your honeymoon with personalized touches such as a romantic bath, signature romantic turndown and a flower bouquet. Where to Eat: Garland's Oak Creek Lodge (Phone: 928-890-4023) serves an innovative menu that incorporates ingredients from the hotel’s own garden and orchard. Don’t miss: Go on a Jeep tour through the rugged countryside. Once the capital of the Hawaiian Kingdom and a famous whaling village known as ‘Lele’, meaning ‘relentless sun’ in Hawaiian, the small island town of Lahaina in Maui< is steeped in history. Basking in the sun on Maui, whose shimmering beaches, ancient sacred valleys and rugged lava landscapes of the world’s largest dormant volcano have made it one of the best honeymoon destinations in the world, this quaint town is a must-see. The spirit of old Lahaina is still very much alive as you stroll down the vibrant Front Street and along the Lahaina Historic Trail, which is home to fascinating stops. Beautiful sunny climate and picture-postcard scenery of palm-fringed sands lapped by blue ocean are the perfect setting for savoring some of Maui’s famed farm-to-table cuisine as you watch humpback whales breach in the bay. More romantic things to do on Maui. Where to Stay: Lahaina Inn (from $99, Phone: 808-661-0577) is located in the center of town and offers 12 guest accommodations with plantation-inspired décor. Ask about the Oceanside Junior Suite on your honeymoon. Where to Eat: Lahaina Grill (Phone: 808-667-5117) is a contemporary bistro serving fresh seafood, meat and other tempting fare. Don’t miss: Go on a dolphin or whale watching tour. Guarded by a 200-year-old lighthouse that serves as a beacon for this coastal Long Island town, Montauk is a relaxing weekend getaway from New York City. Once home to only fishermen and surfers, the area now offers chic boutiques and stylish hotels that give the sleepy village a relaxed sense of style. Where to Stay: The Montauk Yacht Club Resort & Marina (from $326) is located on the water’s edge with a sandy beach, pools and 103 guest accommodations. Where to Eat: Navy Beach makes you feel like you are dining on a luxury yacht. Don’t miss: Head to Montauk Point State Park with a pair of binoculars for seal and whale watching. Breath-taking natural scenery and sweeping views of Mobile Bay have long made the small town of Fairhope on Alabama’s Gulf Coast an ideal escape from busy city life. Fairhope offers a wonderful array of things to see and do around town. Journey back in time with a visit to the site of the last major battle of the Civil War where Fort Blakeley fell, or go on a landmark tour of the Point Clear Historic District that highlights beautifully preserved mansions along the bayside promenade, and old Civil War trails. Hiking and horseback riding are available at Oak Hollow Farm, while the Fairhope Municipal Pier is the perfect spot for swimming, beach walking, picnics and romantic sunsets. Spanish Fort is one of the town’s most popular attractions, where the Apalachee, Blakeley, Mobile, Tensaw, and Spanish Rivers converge and flow into Mobile Bay to create a network of scenic waterways, wetlands and woods. Where to Stay: The Fairhope Inn (from $120, Phone: 251-928-6226) is an elegant hideaway with four-posted beds, a restaurant and a convenient Downtown Fairhope location. Where to Eat: Panini Pete’s (Phone: 251-929-0122) serves mouthwatering burgers and panini, prepared with homemade bread and fries. Located in Bartholomew County in Indiana, Columbus is well known for its rich architectural history and is home to an exceptional collection of works by renowned architects, as well as seven historic national landmarks, such as Eero Saarinen’s Miller House and Garden, his Irwin Conference Centre and North Christian Church. 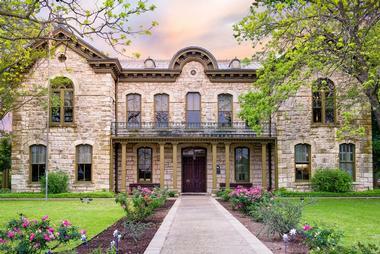 Beautifully preserved landmarks are picture-perfect gems, such as the Bartholomew County Courthouse, as well as the First Baptist Church, while the New Brownsville Covered Bridge is part of a wonderful city park where you can relax surrounded by nature. Where to Stay: Hotel Indigo (from $95) is located in Downtown Columbus near attractions, shops and restaurants. Where to Eat: Tre Bicchieri (Phone: 812-372-1962) is a romantic Italian restaurant where you can celebrate your honeymoon with a candlelight dinner. Don’t miss: Visit Zaharakos an elegantly-restored 1900-style ice cream parlor and toy museum, where you can indulge in delicious sodas and ice cream while enjoying a journey back to childhood surrounded by handmade toys. 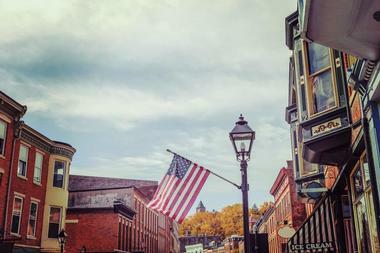 Nestled in the heart of the Midwest, the historic town of Galena is an idyllic escape from the city. 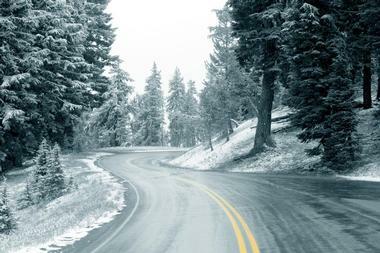 Seemingly frozen in time with its striking architectural heritage and beautifully preserved examples of styles, ranging from French Colonial to Greek Revival, Galena offers a relaxing sojourn back in time. The six-block Main Street brims with history - visit the Old Market House and the Historical Society and Museum, which is housed in a spectacular Italianate home, or peek into the mansion of the 18th US President, General Ulysses S. Grant, who resided here just before leading the Union troops in the Civil War. Explore the Vinegar Hill Lead Mine, a reminder of the town’s pre-war booming lead-mining industry. Enjoy a variety of outdoor activities in and around town during the summer months, from boating, fishing, camping and horseback riding to hiking, biking, hot air ballooning, and golf. In the winter, the area offers powder-white slopes for skiing and snowboarding. Where to Stay: The romantic cottages at The Inn at Irish Hollow (from $465) are perfect for honeymooners looking for a secluded escape. Where to Eat: One Eleven Main in downtown Galena serves dishes prepared with locally-sourced ingredients. 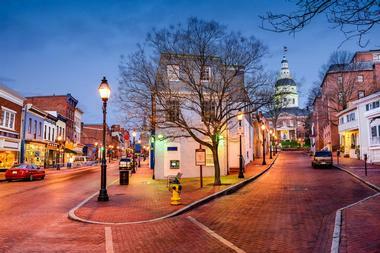 Once a colonial seaport and the nation’s first peacetime capital resting on the shores of Chesapeake Bay at the mouth of the Severn River, Annapolis is dotted with 18th century buildings and its rich history is evident at every corner. Quaint brick-lined streets are home to beautiful examples of architecture, while an array of interesting museums and galleries tell the story of the centuries-old port town. Home to the US Naval Academy and the Maryland State House, the oldest state capitol still in use, history buffs will delight in the town’s interesting offerings. Known as America’s Sailing Capital, the city is a paradise for water-lovers, and the marina is full of sailing vessels, old and new. Dine on fresh crab cakes at one of the waterfront cafés and listen to the sound of tinkling yacht masts as they bob gently in the breeze. Head into the patchwork of rich farmlands of the Annapolis Countryside, where the story of generations of farmers and watermen is alive in the quaint 19th century bungalows whose hammocks sway gently on their porches. Where to Stay: The Reynolds Tavern is a romantic inn close to the State Capitol. 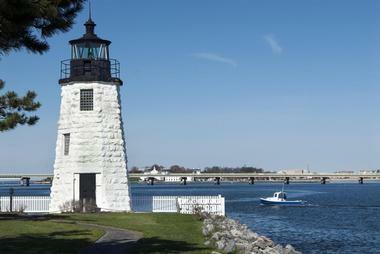 Don’t miss: Sailing on Chesapeake Bay. 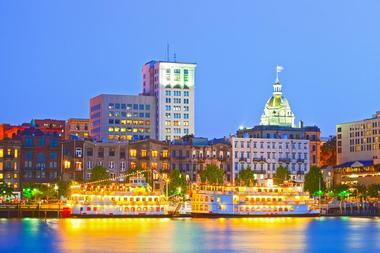 Home to a rich history that is reflected in its quaint cobblestone streets lined with majestic antebellum architecture and shaded by a leafy emerald canopy that bursts into bloom every spring, Savannah is a classic Southern city with a pure southern charm. A strategic port city during the American Revolution and American Civil War, Savannah offers many diverse things to see and do. The city’s pedestrian-friendly layout and innovative urban design is ideal for strolling and exploring. Wander through the azalea-lined Historic District and soak up the city’s history reflected in the opulent mansions, old cotton warehouses and beautifully preserved Colonial public buildings. Head to the pristine beaches of Tybee Island for a relaxing escape where you can sunbathe, swim, sail and fish with Atlantic Ocean views. Famed for its elaborate St Patrick’s Day celebration, the city is packed with activities, from food and music festivals to Civil War re-enactments. Read more. Where to Stay: Azalea Inn & Gardens is a beautiful place to stay for couples, featuring a romantic garden and an outdoor pool. Where to Eat: The Olde Pink House Restaurant is located in a 18th century mansion. Don’t miss: Take a ghost-hunters tour in a chauffeured hearse around the city’s ‘haunted’ alleyways. 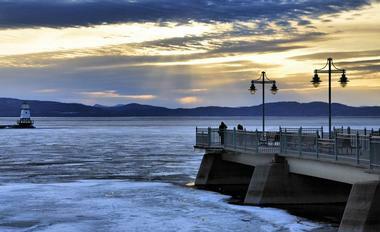 Perched on the shore of Lake Champlain, Burlington is a vibrant, cultural and spirited lakeside city and an ideal base for exploring northwestern Vermont. Located just minutes from some of Vermont’s most beautiful lake and mountain regions, and home to an array of galleries, markets and antique stores, Burlington offers the best of both outdoor and urban delights. If your passion is the outdoors, head down to the waterfront, where you can kayak, water-ski, sail and swim. Take a cruise on the lake or hit the trail-packed woodlands for a run, hike or bike in the great outdoors. The town is packed with an incredible selection of excellent restaurants featuring world-renowned chefs, chic coffee shops and trendy boutique stores, while local wineries, breweries and cheese-makers offer their best at the popular Church Street Marketplace. Take in a performance at the Flynn Center for the Performing Arts, sip handcrafted beers at a busy pub as you listen to live music, or dance the night away at one of the buzzing nightclubs around town. Read more. Where to Stay: Made INN Vermont (from $225, Phone: 802-399-2788) is a chic downtown inn with boutique accommodations which can be customized to your taste. Where to Eat: Juniper at Hotel Vermont serves an eco-conscious menu that incorporates locally grown vegetables, meats, beers and wine. 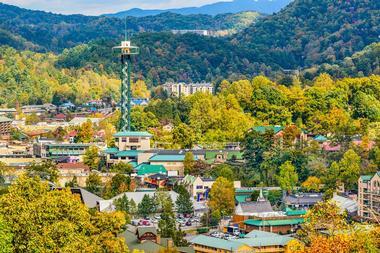 Nestled in the foothills of scenic mountains and surrounded by spectacular natural beauty, Gatlinburg is a gateway to the world-renowned Great Smoky Mountains National Park, the most visited national park in America. Welcoming visitors in true Appalachian-style, the town brims with a variety of accommodation to suit every need, a range of restaurants, cafés and bars serving local and international fare, and a plethora of adventures and activities to enjoy. Wander down the Downtown Parkway for a buzzing, energetic vibe, crowds of people and a rich variety of things to see and do, or head to the River Walk for a quieter stroll along the Little Pigeon River where you can relax on benches on the way and soak up the beautiful views. Where to Stay: The Edgewater Hotel (from $100) has an indoor/outdoor heated pool, Jacuzzis and contemporary rooms with private balconies. Where to Eat: The balcony at Blaine’s lets you look at the mountains while you dine on fish, pasta, burgers, slow cooked ribs, fajitas and other favorites. Don’t Miss: Gatlinburg Sky Lift for a breath-taking view of the city below. Surrounded by the spectacular natural beauty of Acadia National Park on Mount Desert Island, Bar Harbor is a quiet, historic coastal town in the heart of Maine that promises to leave a lasting impression. High granite cliffs tower over white sandy beaches against the backdrop of the majestic Cadillac Mountain in the distance. Once a 19th century summer resort for the wealthy, the town is brimming with history and a gentle stroll along West Street makes for an interesting afternoon. Where to Stay: The Mira Monte Inn (from $118) is a historic bed and breakfast with period furnishings, fireplaces and balconies. 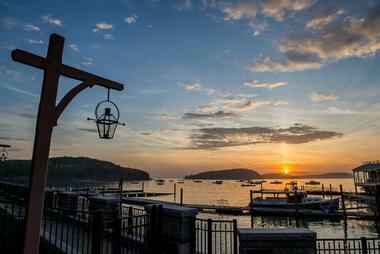 Where to Eat: Sample local seafood and other favorites at Galyn's, located near the Bar Harbor town pier. Don’t Miss: A sunset whale watching tour. Homer is an incredible honeymoon destination, surrounded by majestic snow-capped mountain peaks, shimmering ice-blue glaciers, dense, forested slopes and the cobalt blue waters of Kachemak Bay. Resting on the famous Homer Spit, which extends out into the bay like a spiny finger, this tiny Alaskan town is protected by the Kenai Mountains, creating a tranquil haven in which you could spend a lifetime. Breath-taking panoramic scenery attracts visitors from afar, and the town offers a wealth of activities and interesting things to see and do. Foodies will delight in a variety of coffee bars, gourmet sandwich stores and trendy restaurants scattered around town. A number of excellent art galleries, museums and theaters attribute to Homer’s renowned reputation as being the cultural capital of South-central Alaska. The Homer Spit hums with tourists in the summer who are taking advantage of the pristine natural beauty to enjoy camping, fishing, birding, and boating, while the Kachemak Bay State Wilderness Park on the other side of the bay is an oasis for outdoor enthusiasts to explore on foot, by mountain bike or in a canoe. Where to Stay: Homer Inn & Spa (from $129) offers incredible views of Kachemak Bay, hot tub, Jacuzzi and a relaxing day spa. Where to Eat: The Chart Room Restaurant & Lounge serves local seafood in a beautiful dining room with floor-to-ceiling windows overlooking the bay. Don’t Miss: A bear viewing tour. 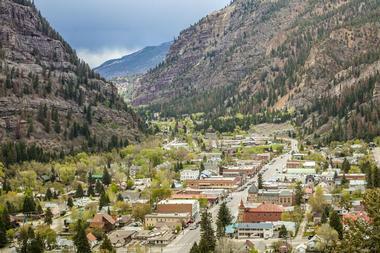 Surrounded by the spectacular snow-capped San Juan Mountains and tucked away at the head of a deep valley, the quaint historic town of Ouray almost makes you think that you are in Switzerland. Outdoor enthusiasts will delight in the beautiful surroundings and a diverse choice of activities. The deep canyons attract professional ice climbers from around the world and play host to the annual Ouray Ice Festival each January, which showcases the best in this daring sport. Wonderful hiking trails around Box Canyon Falls wind past several magnificent waterfalls, while the dense forests of quaking aspen and evergreens scrub oaks transform into a spectacular canvas of color each autumn. Head to the local pool for a therapeutic soak, which is fed by natural hot springs, and take a romantic tour of the town in a turn-of-the-century carriage. Explore the unique artisan shops, art galleries, restaurants and cafés in this alpine town which dates back to the late 1870s. Where to Stay: Beaumont Hotel & Spa (from $169) is a luxury getaway with 12 elegant guest accommodations which only cater to adult guests. Where to Eat: Ouray Brewery has a full service restaurant, an on-site craft brewery and a romantic roof-top location in town. Don’t Miss: A dip in the Ouray Hot Springs Pool. 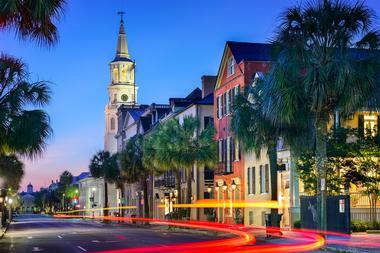 Charleston will take you on a sojourn back in time. This old-world metropolis is home to beautiful antebellum architecture, celebrated restaurants and a wealth of churches. Stroll along gardenia-lined avenues and soak up the beautifully preserved homes and buildings that echo an era past, stand on the site of the first shot in the Civil War, and visit monumental battleships. 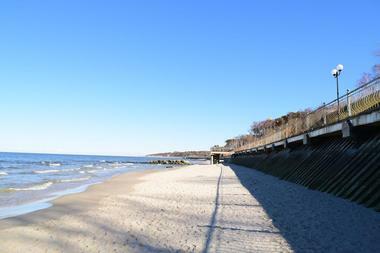 Stay in a charming inn downtown or at a luxury resort with championship golf, tennis, and sandy beaches. The year-round mild climate and the city’s choice of excellent restaurants, bars and vibrant nightlife will ensure a memorable honeymoon. Read more. 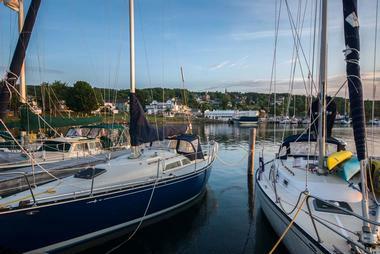 Where to Stay: Harbourview Inn (from $289) offers spectacular views of the water and 52 romantic guest accommodations. Where to Eat: 167 Raw for fresh lobster rolls or Magnolias for some of the best Southern pie. Don’t miss: Tour one of the historic plantations and their manicured gardens. Bend is a West Coast honeymoon destination, renowned for its spectacular natural beauty and dramatic terrain that provides a wealth of activities throughout the year. Outdoor adventurers and wilderness-lovers gravitate to the small mountain town to soak up its alluring surroundings. Nestled between the foothills of the Cascades Mountains in Oregon, Bend offers easy access to a diverse choice of activities. Whether you are looking to climb mountains, ski down slopes, hike amazing trails, or mountain bike down rugged paths, there is something for everyone. The slopes of the majestic Mt. Bachelor provide powdered perfection for skiers and snowboarders, while South Sister offers a challenging summit climb for both amateurs and professionals. Deschutes River and its tranquil mountain lakes offer excellent rafting, kayaking and canoeing. Miles of backcountry trails are a hiking and mountain-biking heaven, while the legendary Bend Ale Trail is the largest beer trail in the west. When you have had enough action, soak in one of the many spas, catch an art exhibit, visit museums and learn about the history of the area, or dine on award-winning cuisine at one of the many excellent restaurants in town. Things to Do in Bend. Where to Stay: Lara House Bed and Breakfast (from $155) has six romantic guest rooms, a fireplace and a sunroom. Where to Eat: 10 Below Restaurant and Lounge at Oxford Hotel serves dishes prepared with locally sourced ingredients in an elegant setting. Don’t Miss: A romantic Moonlight & Starlight Snowshoe Tour.